Ht / Wt: 6'4" / 231 lb. 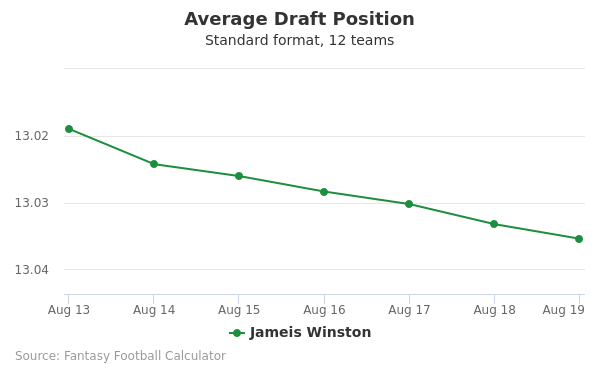 Jameis Winston's fantasy value is measured by his average draft position (ADP) in fantasy football mock drafts. 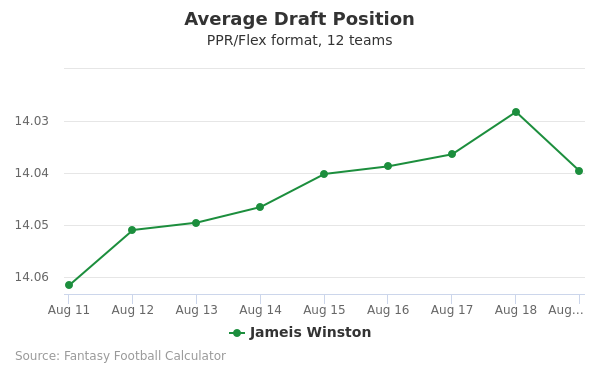 In recent drafts, Winston's current ADP is 9.09, which indicates that his fantasy outlook is to be the 9th pick of the 9th round, and 104th selection overall. 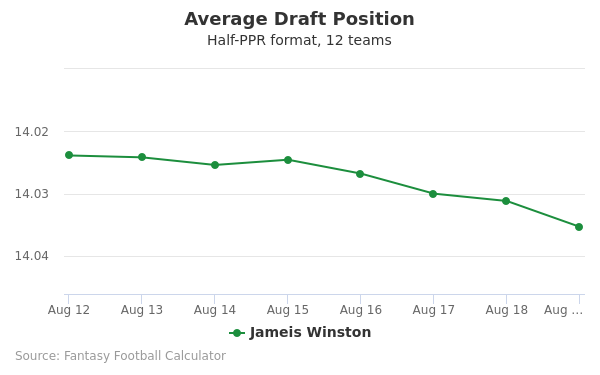 The code below will display a graph that updates every day to show the ADP data for Jameis Winston for the past 30 days in 12-team PPR leagues. Draft Jameis Winston or Tom Brady? Draft Golden Tate or Jameis Winston? Draft Gus Edwards or Jameis Winston? Draft Jameis Winston or Matt Breida? Draft Adrian Peterson or Jameis Winston? Draft Jameis Winston or Trey Burton? Draft Devin Funchess or Jameis Winston? Draft Baltimore Defense or Jameis Winston? Draft Dion Lewis or Jameis Winston? Draft Jameis Winston or Jimmy Garoppolo? Draft Donta Foreman or Jameis Winston? Draft Jameis Winston or Marquise Goodwin? Draft Jameis Winston or Kirk Cousins? Draft Ben Roethlisberger or Jameis Winston? Draft Jameis Winston or Larry Fitzgerald? Draft Jameis Winston or LA Chargers Defense? Draft Jacksonville Defense or Jameis Winston? Draft Delanie Walker or Jameis Winston? Draft Jameis Winston or Lamar Jackson? Draft Jameis Winston or Josh Allen? Draft Geronimo Allison or Jameis Winston? Draft Greg Zuerlein or Jameis Winston? Draft Houston Defense or Jameis Winston? Draft Jameis Winston or James Washington? Draft Jameis Winston or Rex Burkhead? Start Jameis Winston or Tom Brady? Start Golden Tate or Jameis Winston? Start Gus Edwards or Jameis Winston? Start Jameis Winston or Matt Breida? Start Adrian Peterson or Jameis Winston? Start Jameis Winston or Trey Burton? Start Devin Funchess or Jameis Winston? Start Baltimore Defense or Jameis Winston? Start Dion Lewis or Jameis Winston? Start Jameis Winston or Jimmy Garoppolo? Start Donta Foreman or Jameis Winston? Start Jameis Winston or Marquise Goodwin? Start Jameis Winston or Kirk Cousins? Start Ben Roethlisberger or Jameis Winston? Start Jameis Winston or Larry Fitzgerald? Start Jameis Winston or LA Chargers Defense? Start Jacksonville Defense or Jameis Winston? Start Delanie Walker or Jameis Winston? Start Jameis Winston or Lamar Jackson? Start Jameis Winston or Josh Allen? Start Geronimo Allison or Jameis Winston? Start Greg Zuerlein or Jameis Winston? Start Houston Defense or Jameis Winston? Start Jameis Winston or James Washington? Start Jameis Winston or Rex Burkhead? Jameis Winston is currently a quarterback with the Tampa Bay Buccaneers and one of the most celebrated, if controversial, players in the league. In high school, he was rated the best "dual-threat" quarterback in the nation and one who earned "Player of the Year" awards from Gatorade in his native Alabama. His high school team, Hueytown, won a state championship under him during his junior year. While deciding to attend Florida State University in 2012, the Texas Rangers professional baseball team drafted him out of high school, but he declined to concentrate on football and college baseball. 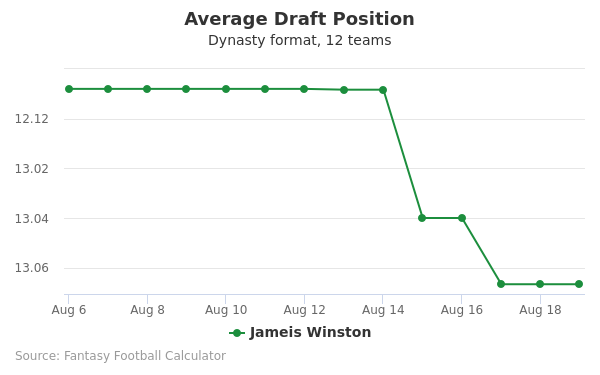 Though Winston played just two years before jumping to the NFL Draft, his career was huge. In his freshman year, he completed 257 passes for a completion percentage of 66.9 percent for an average of 10.6 yards. He threw for a shocking 4,057 yards while completing 40 touchdown passes and throwing only 10 interceptions. In spite of some personal controversy, Winston led FSU to a 13-0 regular season record and beat Auburn 34-31 in the title game - on his 20th birthday. He received that year's Heisman Trophy, at 19 the youngest player ever to do so. His sophomore year of 2014 saw FSU remain strong, as they went 13-0 in the regular season. During this stretch, he earned 3,907 yards passing and had 25 touchdowns to 18 interceptions. His only slip occurred in the 2014 championship game against Oregon. Winston lost this game 59-20, his only college loss ever for a staggering 26-1 record. He entered the NFL Draft as the likely No. 1 View his highlights here. Winston's NFL combine numbers were solid, if not incredible. He earned a grade of 6.7 for his 40 time of 4.97, his vertical leap of 28.5 inches, and his broad jump of 103 inches. Scouts considered these numbers as irrelevant to his advanced ability to read pass windows and his skills as a large (6'4", 231 pounds) dual-threat as a running quarterback. As expected, he went first in the draft, being chosen over Marcus Mariota, the Oregon quarterback who had beaten him. His salary was $23.35 million on a four-year contract. Due to his dual-sport abilities (as he was also a skilled FSU baseball player), his contract stated that he could not play any other sport. This prevented him from becoming a player like Bo Jackson who excelled in two professional sports. In his 2015 rookie season, Winston made an immediate impact on Tampa Bay. The previous year, they had a paltry 2-14 record. Under Winston, who stated every game, they went 6-10. Winston completed 312 passes out of 535 for a completion rate of 58.3 percent. His yardage total was 4,042, while he threw for 22 touchdowns. His 15 interceptions that year were problematic, though proved his dual-threat status by rushing 54 times for 213 yards and six touchdowns. His 2016 season was even stronger in every aspect. He brought Tampa Bay a 9-7 record and completed 345 passes out of 567 for a completion rate of 60.8 percent. He was just shy of 4,100 passing yards (4,090), while passing for 28 touchdowns. His interception rate did increase to 18 for the season, however. While his rushing dropped to 165 yards on 53 attempts for one touchdown, this was partially due to the improvement of Tampa Bay's running game. View his highlights here. The controversial moments that seemed to hound Winston in college have disappeared as he settles into a professional role. Known as one of the most football-smart players in the league, his upside remains large. His Twitter account reveals a motivated and successful individual looking to help his team succeed.